"The call disconnected. Vijay put his phone down and sat thinking. His mind spun. Who was this mysterious caller? He clearly had an urgent need to meet. So why wait for six months? His explanation didn’t make sense. What preparation did he have to do? And what was he going to reveal to Vijay when they did meet? There were too many questions that were unanswered. Learn more in The Mini Sequel to The Alexander Secret: A Secret Revealed! "Christopher C. Doyle is a bestselling author who transports the reader into a fascinating world where ancient secrets buried in legends blend with science and history to create a gripping story. His debut novel, The Mahabharata Secret featured among the top 10 books of 2013 and was nominated for the Raymond Crossword Book Award, 2014. 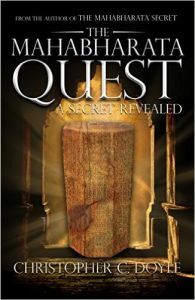 His second novel The Mahabharata Quest: The Alexander Secret, is still among the top bestsellers in the country. An alumnus of St Stephens College, Delhi and IIM Calcutta, Christopher has had a successful career in the corporate sector before embarking on an entrepreneurial journey. He now helps companies to achieve exponential growth and is one of India’s leading CEO coaches. Christopher lives in New Delhi with his wife, daughter and his dog and enjoys writing, reading, swimming and tennis as well as travelling and meeting people. He is also a musician and lives his passion for music through his band called Mid Life Crisis which pays classic rock."